It’s officially fall, or as it’s come to be known in recent years, pumpkin spice season! Pumpkin spice has taken over everything from food products to drinks to candles to cleaning supplies. 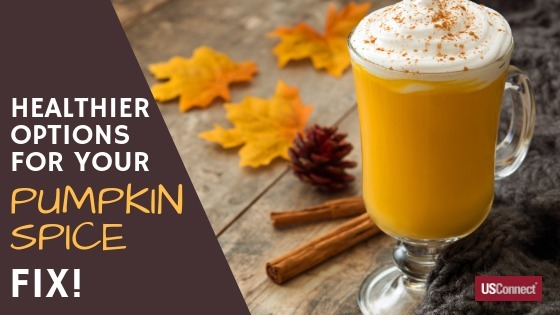 When it comes to food and drinks, there are healthy pumpkin spice choices and some that are just laden with sugar or artificial ingredients, nothing more than seasonal gimmicks to get you to buy junk food. You can enjoy your favorite seasonal spice and still maintain a healthy diet if you chose the right pumpkin spice foods. And if you cannot resist that Pumpkin Spice Latte, as long as it isn’t an everyday indulgence, you can still enjoy it in moderation and not completely derail your diet. Learn which popular pumpkin spice products are good choices and which ones to limit to special treats or not at all. Starbucks Pumpkin Spice Latte – At 380 calories for a 16 oz. with 14 grams of fat and a whopping 49 grams of sugar (even more for larger sizes), this popular coffee drink should remain an occasional treat and not an everyday habit this season. Dunkin’ Donuts Pumpkin Donut – This dessert packs 19 grams of fat and 19 grams of sugar per donut, and who can eat just one? Nestle Coffee-Mate Pumpkin Spice Liquid Coffee Creamer – Think you can save money and calories by making your own version of a pumpkin spice latte? Think again. While this creamer claims to be free of trans fats, it contains partially hydrogenated oils, which are a source of trans fats. Clif Bar Spiced Pumpkin Pie Energy Bars – There are good protein bars and bad protein bars, and this one falls into the latter category. With only 9 grams of protein, it contains 23 grams of sugar, and will only give you a temporary energy boost before leaving you tired and sluggish. Chobani Flip Pumpkin Harvest Crisp – While this yogurt does contain probiotics and protein, it also comes in at 200 calories and 17 grams of sugar. This one qualifies more as a dessert than a healthy snack. Pumpkin Spice Cheerios – Like their original cereal, Pumpkin Spice Cheerios are low in calories and high in whole grains. A serving does contain 8 grams of sugar but is a better breakfast choice than a pumpkin spiced baked treat. Chobani Pumpkin Spice Blended Yogurt – Curb pumpkin spice sugary cravings with this Greek yogurt that’s packed with protein and live active cultures but still low in calories. Kashi TLC Pumpkin Spice Flax Crunchy Granola Bars – With whole pumpkin seeds and flax seeds, this treat can satisfy crunchy cravings while providing healthy nutrients. And one serving is two bars! Pumpkin Spice Quaker Instant Oatmeal – A fall favorite for mornings that’s convenient and easy to make, this oatmeal is low in calories, fat, and sodium. Yasso Pumpkin Cheesecake Bar – This frozen yogurt bar tastes like the real thing and with only 120 calories and 5 grams of protein, it makes a great substitute for sugary pumpkin spice desserts.